Most days with fog: 189 days of the year. Abdul, April, Arwin, Barra, Boby, Bompur, Booboo, Bophur, Borga, Chalky, Changi, Colic, Dad, Dove, Dusty III, Eleanor, Elsa, Esk, Evie, Fedu, Flossie, Francoise, Frodo, Frosty, Gandalf, Gollum, Ham, Inga, Jock III, Josie, Lady III, Lassie II, Lin, Lister, Lobo II, Luqa, Merry I, Michelle, Mitral, Mitya, Nuga, Pat, Pippin, Pop, Rastus II, Ratti, Rolf, Rosie III, Rover IIII, Royal, Seletar, Sharjah, Shem, Skipper, Skye, Snowy II, Staffa, Stroma, Suaq, Teifi, Tengah, Trixie, Umiak II, Wensen, Whisky II, Wilfred, Zita. 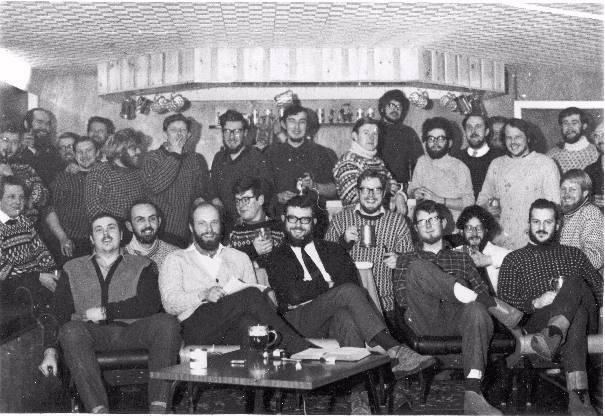 Standing from left to right: PS Mountford (Meteorologist), JM Gallsworthy (Carpenter), PH Coslett (Glaciologist), J Carter (Diesel Mechanic), WA Etchells (Tractor Mechanic), AC Wager (Glaciologist), TH Wiggans (GA), JA Chalmers (Physicist), DS MacLennan (Cook), AM Roberts (Medical Officer), DC Groom (Ionosphericist), DE French (Meteorologist), CM Hodson (WOM), ECE Platt (Meteorologist), WR Laidlaw (Physicist), PD Clarkson (Geologist), PT Pitts (Ionosphericist). Sitting from left to right: KJ Gainey (Radar Mechanic), CL Jones (Cook), NW Riley (GA), CCR Sykes (BC & Tractor Mechanic), N Mathys (GA), AJ Fry (Physiologist), MJ Skidmore (Geologist), JH Jamieson (Physicist), MS Durrant (Meteorologist), K Halliday (WOM), PH Noble (GA). Out of shot: G Smith (Electrician), AS MacQuarrie (Tractor Mechanic). Left to right (information from Peter 'Rocky' Clarkson): Mike Durrant, head with spectacles bent forward; ???? 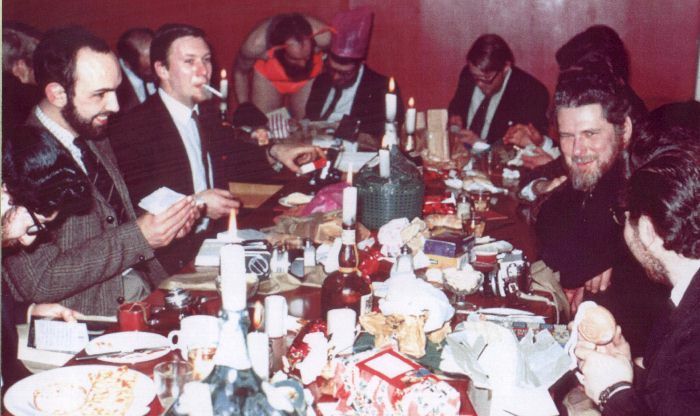 with head half hidden but possibly Peter Mountford; Norris Riley; Chris Sykes, bald head bent forward; John Carter with cigarette; John (Golly) Gallsworthy in "bunny" costume; John Fry; Paul Coslett; Jim Chalmers (probably), just the profile of the top of his head; Alan (Dad) Etchells (doesn't he look young! ); ???? another head largely hidden but possibly Nick Mathys; Keith Gainey. Peter says: "With Golly and Bill Laidlaw, I was one of the 'bunny girls' waiting at table.� It was Golly's idea and we felt right prats as you can probably imagine!� But it was a great occasion." 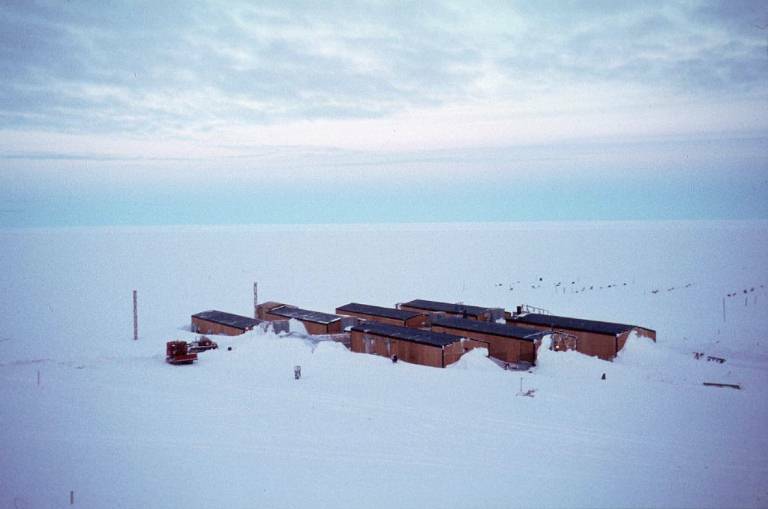 Halley 2 after first winter, 1967/68 season; replaced in 1973 due to crushing by build up of snow and ice. From the BAS image library ref: 10004216; used with permission. No unauthorised copying.